Along comes a book by a storyteller who holds the power, in true stories well told, to offer a motivating and healing balm for those thirsting and eager for somebody to remind them to "say YES to life, slow down, wake up, let go, hold on and LIVE!" As readers listen to Baumbich's stories, laugh and cry, and then revisit their own stories, they will discover the sovereign hand of God not only loving them in the midst of adversity but wooing them to live life to the full.Readers should fasten their seatbelts for this warm, fun, provocative, heartwarming ride. "We are so busy running our lives that we are often not enjoying them, giving thanks for them, or realizing our joy and potential," Charlene says. "But if you learn the lively and releasing art of listening to and mining your own stories, you'll learn that your life is, indeed, better than you think! - Publisher The award-winning author of the dearest dorothy novels, called by Guideposts "one of today's most popular and bestloved Christian humorists," motivates readers to laugh, play, and relish the good things in life. Charlene Ann Baumbich has always spoken and written about the layers of life just as she sees them-slightly off-center, mostly dead-on, and always through the lens of grace. With Don't Miss Your Life! Charlene Ann Baumbich's creative pedal is to the floor, her cranky gallbladder has been "left behind," and her storytelling is in full swing. Fasten your seatbelts! With her signature warmth and candor, Charlene offers readers insight on how to become their own best storytellers of what God is doing in their lives. She does far more than show why it is so important to slow down, enjoy our blessings, and not take things so seriously. She encourages everyone to build a "memory portfolio" of special life moments, and in doing so to grow in wisdom, learning how to see God's hand in our daily lives is the key to a rich and fulfilling life. 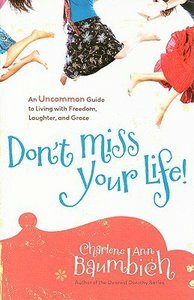 About "Don't Miss Your Life!" The award-winning author of the dearest dorothy novels, called by Guideposts "one of today's most popular and bestloved Christian humorists," motivates readers to laugh, play, and relish the good things in life.